Take a field trip and make some art! 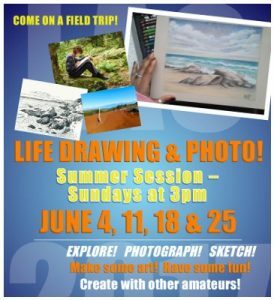 LHES teacher and amateur artist Lisa Galloway will organize and help take photos, draw “en plein air” (outside) and explore the drawing media and subjects found there. Based on participants’ wishes, and weather, we’ll carpool to a different location each time we meet – desert, forest, beach and/or the human-made environment. Lisa will guide activities that reduce the stress and challenges of drawing, and increase your fun and confidence! Participants must be 14 years or older. Class size will be no more than ten people! Each session will meet at 3pm at the high school art room. Sessions will be every Sunday in June (the 4th, 11th, 18th and 25th). This is a non-profit event, so the fees will provide participants with the drawing materials they need, and a chance to matt, mount and/or frame their best artworks for exhibit at the LAC gallery. Participants must have their own camera, and a sketchbook is recommended. Full payment is due no later than June 4th. To sign up please go here. Contact Lisa at lisa.on.lanai@gmail.com or leave her a message at the Lanai Art Center. Call 565-7503 or drop by!